Managing digital identities and access control for users, applications and things remains one of the greatest challenges facing cloud computing today. This has led to a new cloud security service paradigm that requires your organization to reevaluate the criteria for designing and implementing identity and access management (IAM) services across data centers, and private and public cloud infrastructure. This new criteria addresses the continued transformation to the cloud, mobile and internet of things (IoT), and the increased demand for open business balanced by user data security found in initiatives such as GDPR, Open Banking and PSD2. In this webinar, you will learn about key requirements and design principles required for modern IAM systems, and how to effectively drive digital transformation, address user data security regulations and ensure you successfully manage your company’s transformation to the cloud. Any usage of multi-factor authentication (MFA) is better than securing the enterprise with passwords alone, but adaptive and risk-based MFA delivers more secure, usable and cost-effective authentication. Adaptive authentication leverages contextual mechanisms, such as geolocation, time of day, IP address and device identifiers, to determine whether a user should be given access or asked for additional factors. While adaptive authentication is the most secure way to protect the enterprise, most solutions are much too rigid for administrators to manage and also create a painful user experience for partners, customers and employees alike. Ping Identity's MFA solution gives users a seamless experience which improving enterprise security. In 2019, this bad yet often repeated advice for implementing multi-factor authentication (MFA) should no longer apply in the enterprise, where compromised credentials continue to represent the #1 attack vector. You need MFA everywhere - on every app, API, VPN and even when logging into corporate devices. But implementing MFA everywhere isn’t easy, and surprising roadblocks can appear along the way. Join Andrew Goodman, Ping Marketing Manager, to learn the requirements for rapid adoption and implementation of MFA everywhere. APIs are presenting new opportunities for hackers to reach into data and systems, and predefined rules, policies and attack signatures can’t keep up with this evolving threat landscape. Join us for a panel discussion surrounding today’s API threat landscape, and how enterprises are combining access control with advanced API cybersecurity for comprehensive API protection. The panel will feature discussion from nationally recognized thought leaders in the API space listed below, as well as open dialog and Q&A. Learn how identity & access management (IAM) solutions, built on open standards, can help meet the technical requirements of PSD2 and Open Banking, including secure XS2A (access to accounts), Strong Customer Authentication (SCA), Dynamic Linking, and Consent Management, all while providing a seamless user experience and distinct competitive advantage. Sure, you can spell enterprise security without the letters M-F-A, but the modern digital enterprise isn't as cyber secure without a strong multi-factor authentication (MFA) strategy. Enterprises are under attack, and credentials are a primary target. According to the 2015 Verizon DBIR, 95% of all web app hacks involve credentials that were harvested from customer devices. Many leading enterprises are enhancing their security and control with MFA, allowing them to move away from a high-risk, password based security approach and to give their employees, partners, and customers a better user experience. Delivering a Single SignOn (SSO) experience to users of native applications is becoming more and more critical as the number of such applications grows. We'll cover the best practice for native applications authenticating to restful APIs, the different models for enabling SSO across such applications, and how recent enhancements to the mobile OSs promise to offer to a nice balance between usability, security, and deployment ease. Con la crescente adozione di applicazioni cloud (Software As a Service) le aziende si trovano a fronteggiare il problema di garantire l'accesso dei propri dipendenti a tali applicazioni. 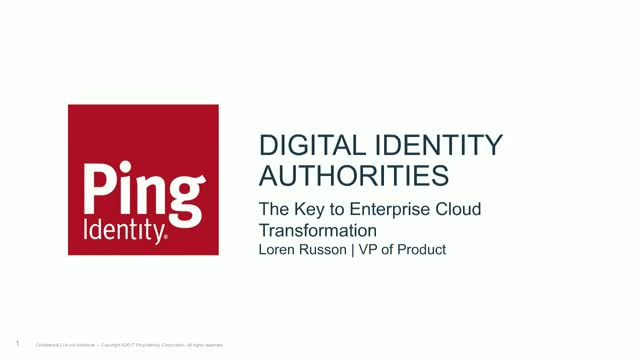 Durante il Webinar verrà discusso come gli attuali standard di federazione indirizzano tale tematica e come le soluzioni di Ping Identity aiutino le aziende a garantire che gli accessi alle applicazioni cloud avvengano in modo sicuro e allo stesso con una buona "user experience"
Tune into this insightful webinar with Ping Identity CTO Hans Zandbelt on how best practice Identity & Access Management has your back! Travel through the Identiverse and discover the importance of identity security in a connected world. Join David Gorton as he goes over securing access to multiple applications, as well as the architect identity frameworks for all your applications. David Gorton is a Product Manager with Ping Identity. He has more than 15 years of designing, developing, testing, and maintaining highly performant enterprise software systems. He spent six years building and maintaining BEA Weblogic Workshop for webservice and J2EE development. Now David focuses his time on creating next generation identity and access management products that will solve hard enterprise problems. Employees are bringing their own tablets, smartphones, personal computing devices – and their expectations of how they want to perform their jobs, to work. But, whether the employee or enterprise bought the phone, with shared-use devices the fundamental requirements are the same – keep business data secure, and personal data private. Why is BYOD an identity problem? What BYOD factors must be balanced? What identity standards can help address BYOD? Why identity and security is key to the Cloud and how we can make it work. In this session Andrew will explore how Cloud single sign-on, implemented the right way using well-established standards, is helping to solve both the security and the convenience problem; and will look at how these standards are evolving to include broader trends of mobile and API access. Andrew's expertise in digital business and identity is built on 6 years of worldwide experience at Ping Identity across a broad range of private and public sector identity projects. Before joining Ping, Andrew held a variety of technical architecture and product management positions with leading software companies including Allaire, Macromedia and Adobe. He is currently Director of World Wide Technical Marketing at Ping Identity. Explore Cloud Identity Security with Ping Identity. Find out how our identity and access management platform gives enterprise customers and employees one-click access to any application from any device.